So I picked up the pace a little this month, as compared to August. I finished 15 print/ebooks for a total of nearly 5,000 pages read and listened to 5 audiobooks, totaling over 70 hours of listening. What stands out most this month is, I think, the really interesting nonfiction I read. I actually finished 5 nonfiction titles, three of which were reviewed this month (I completed An Accidental Mother over the summer and just reviewed it this month). All were very interesting and though-provoking. I am remembering why I love nonfiction so much! Here’s hoping that October results in even more books read, although my weekends are scarily packed. Well, there an audiobook being chosen as Pick of the Month for the second month in a row! 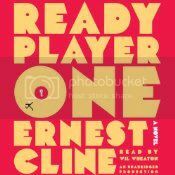 Ready Player One by Ernest Cline won the honors by having both a rip-roaring good story, and a fantastic audio production, narrated by none other than Wil Wheaton. Margaret Mitchell’s Gone With the Wind by Ellen F. Brown and John Wiley, Jr.
Two audios I really want to listen to are Ready Player One and The Leftovers. What a great month you had! I just finished Gone With the Wind, I’ll be looking for a review of Margaret Mitchell’s Gone With the Wind by Ellen F. Brown and John Wiley, Jr. I might find that interesting! You make me wish I’d started Ready Player One instead of The Last Werewolf. Gotta get through that one. It is not tripping my trigger, but I do love the narrator. I’m so jealous you were able to read so much this month! I had a very slow reading month, which was a bummer. Looks like you had a great month! I am looking forward to reading Ready Player One at some point. I have Ready Player One in print, but maybe I’ll listen to it instead. Great reading month. Also read The Language of Flowers, my favorite this past month! Thanks to you, looking forward to reading Ready Player One.